Best Shavers for Women Reviews. 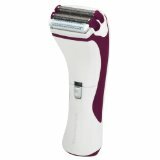 A good, dependable electric shaver is a smart investment for any women with daily shaving needs. While electric shavers cost more than disposable razors, once you make that initial investment you’ll be done throwing away money on razors you can only use once or twice. Women's shavers are different than men’s. They’re designed with women’s needs in mind. Choosing from the best shavers for women will guarantee you the closest and smoothest shave possible, without the need to spend hours each week in the shower, twisting and turning while trying to avoid painful, unattractive cuts and nicks. The razors listed below represent the best options available for women today. With a pivoting, adjustable head, three ultra sharp but safe blades, and the ability to go in the shower or be used dry, the Panasonic Close Curves Wet/Dry Ladies Shaver leads the pack. Features a pop-up trimmer for longer hairs, a bikini attachment, and is fully immersible for easy clean-up. 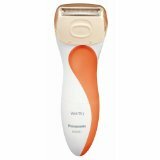 Like the top rated shaver above, the Panasonic ES2207P Close Curves rechargeable Wet/Dry Ladies Shaver offers a competent mix of versatility, practicality, value, and style. Use it in the shower or dry, with shaving gel or without. It has three blades that never need sharpening, a pop-up trimmer for longer stray hairs, and is good for up to ten shaves between charges. #3 Best Shavers for Women. If you’re looking for an affordable, rechargeable women's shaver that gives a smooth and close shave without pulling, nicks or cuts, then the Remington WDF4820 Smooth & Silky Hypoallergenic Foil Shaver is for you. Great for the bikini line, legs and underarms. 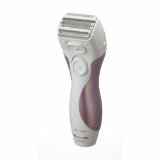 The Remington WDF-3600 Smooth & Silky Women's Shaver does a good job on a woman’s legs and includes a bonus detail trimmer and bikini trim guard. It’s also waterproof for wet or dry use and holds a charge well. Remington does not recommend this model for use on underarms, though, which cuts down on the unit’s versatility. #5 Best Shavers for Women. Affordably priced with an attractive design, the Remington WDF1250SS Smooth & Silky Battery Operated Women's Shaver gives a close, comfortable, one-pass shave without pulling or nicking and features adjacent trimmers for catching longer hairs. This woman's shaver is also waterproof for use in the shower and easy cleanup. While its foils aren’t replaceable, they are durable. The Panasonic ES2291D Ladies Wet/Dry Shaver has a two-in-one design: it’s great on legs and underarms and includes an adjustable length bikini attachment. You can use it wet or dry, but unlike the slightly more expensive Panasonic Close Curves models, this shaver requires two AAA batteries which are not included. This compact, attractive shaver will easily fit in the palm of your hand. Although some consider it a bit noisy, its price, portability, and close and comfortable performance more than compensate. The Clio Designs Palmperfect Electric Shaver Requires two AAA batteries. 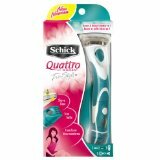 Another great option for women looking for a two-in-one shaver and trimmer, the Schick Quattro For Women Trimstyle Razor & Bikini Trimmer gives a close shave and can be flipped to use as a bikini line trimmer. But please note—the razor portion of this shaver is not powered. The trimmer is powered and runs on one AAA battery.